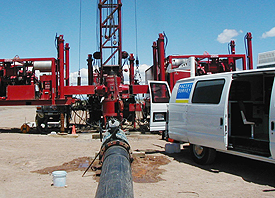 Retrieve down-hole sealed fluid samples under pumping or non-pumping conditions from any depth in well. Procedure of collecting and decontaminating sampler complies with EPA guidelines. The sample chamber is evacuated using a vacuum pump, sealed and sent down-hole to a specific depth. The upper intake valve is opened electronically from the surface and the fluid sample is taken. The upper intake valve is closed before returning to the surface. Once at the surface the sampler is removed from the wire line and the sample is dispensed to collection bottles. The in-situ sample is under pressure and temperature similar to where it was collected, ensuring integrity. All sampler chambers and parts are constructed of stainless steel. Samplers are fully decontaminated between each trip into well, further ensuring sample integrity. The 1 3/8” sampler is often used with the 1” spinner to pass by tight restrictions, such as pump bowls, column pipe that is adjacent to camera entry ports and thru-chlorine tubing that runs below pump intake. Samplers compliment spinner surveys where Mass Balance calculation of analyzed constituents can be used to determine concentration at depth. We can also provide onsite analysis of particular constitutes.